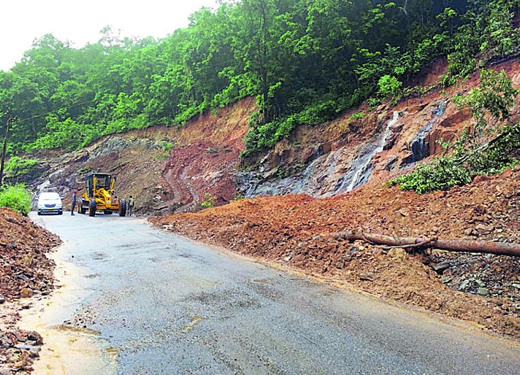 Uppinangady, Aug 14, 2018: With the help of Earthmovers the road at Kodyakallu near Shiradi on NH 75 after a landslide on August 12, Sunday was made passable late night to facilitate the movement of vehicles. The landslide occurred at 10 pm. As a huge heap of soil covered the road, the movement of vehicles were prohibited to facilitate the work to clear the road. The officials and staff members of Larsen and Toubro, which is entrusted with the four-laning work on the road from B C Road and Gundya, rushed to the spot and cleared the road by 1 am. A large number of vehicles, including buses, were stalled in a long queue till the road was cleared. The light vehicles travelled via Periyashanthi-Ichlampady-Mardhala to reach Gundya to proceed on Shiradi Ghat, covering an additional 50 km.